One of the staple foods in the whole-food plant-based diet are beans. In his book "The End of Diabetes: The Eat to Live Plan to Prevent and Reverse Diabetes", Dr. Joel Fuhrman nicknames his diabetes-reversing diet as "the beans and greens diet" indicating that at the heart of the diet are lots of green veggies and beans. Do not shy away from beans because you've been told to avoid carbs! For a start, the message about carbs is to avoid "processed carbs" such as white flour and sugar, etc, but you will often not hear the word "processed". Whole carbs are both essential for good health and providing energy for our bodies. In terms of whole unprocessed carbs, I eat a ton of them every day. Whole grain oats and quinoa at breakfast. Brown rice and beans at lunch. Probably more brown rice with my dinner. Of course, a bunch of veggies and fresh fruit and nuts and seeds are in there too. Every day! People would think that's a lot of carbs. Because of the misinformation out there about carbs, you might think I'd be fat and diabetic, but I am neither. I'm lean, my current BMI is 19, my blood sugar is completely normal. Every time you read or hear that you should avoid carbs, in your mind you must translate that to "I must avoid all processed carbs, and embrace whole complex carbs every day". By eating whole carbs you will feel satisfied and avoid hunger. You don't have to be in a constant state of denying yourself and fighting hunger like you no doubt have in the past when you have been "on a diet". The other thing about beans is that apart from being high in health-giving plant protein and fiber, they are high is what is called "resistant starch". This is starch that the body can't actually digest. 98% of resistant starch passes through the body undigested. So don't be misled by the number of calories listed on a can of beans - your body in fact cannot access many of those calories. Don't believe me? I too was a little skeptical at first, so why not put it to the test for a week. Change your diet so that you eat brown rice and beans every day, as well as a big leafy salad, a variety of fresh fruit, a few nuts such as walnuts and seeds such as pumpkin seeds and sunflower seeds for the week. Do not go overboard on the nuts and seeds: while they provide essential fat for your diet, too much fat, be it from animals or plants, is high in calories. Make sure you weigh yourself at the start of the week, and see how it goes. Most-likely you will weigh less at the end of your trial week and any "bad" blood-work numbers will have improved too. By the way, if you like black beans, you're in luck. 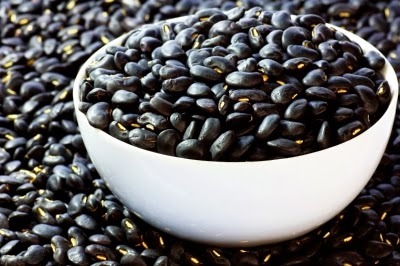 Of all beans, they are the ones with the highest level of resistant starch. Here's my Amazon shopping list to help you get started.